Samsung M20 Offers: Samsung India has been launched all new galaxy M20 Mobile along with M10 in India on 28th January 2019. Samsung Galaxy M20 features an Infinity-v Display panel with fullhd+ screen resolution, 3GB /4GB RAM and 32GB/64GB internal storage, Exynos 7904 processor. Samsung M20 offers great photography experience as it is paired with 13MP + 5MP ultrawide lens dual camera setup. Samsung M20 price in India is Rs.10999 & Rs.12999 for 32GB/64GB variant respectively. Samsung M20 sale is now open. What is Samsung Galaxy M20 Price? Samsung has, of late, been a competitor to other prominent brands in India including Xiaomi and OnePlus, and with the introduction of a new ‘M’ lineup, it has decided to leap one notch ahead of others. One of the three smartphones from the new ‘M’ series, is the Samsung Galaxy M20 offers an Infinity U display, a new Exynos chipset, ultra wide dual cameras, and a long lasting battery with 3X fast charging support. Samsung Galaxy M20 specifications include a 6.3-inch FHD+ display, a new 2.2GHz Octa-core Exynos 7885 chipset by Samsung, a dual rear camera setup with 13MP and 5MP sensors, and an 8MP front facing camera for selfies. Along with the new Exynos chipset, the Samsung Galaxy M20 offers an ARM Mali-G71 MP2 GPU for gaming and other graphics intensive tasks. The smartphone is said to pack a massive 5,000 mAh long lasting battery that will last you two whole days on a single charge, up to 4GB of RAM with up to 64GB inbuilt storage that can be expanded by a microSD card using the dedicated memory expansion slot. 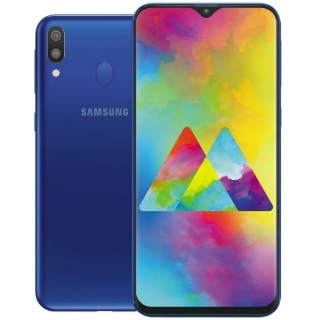 Here, you will get all the best possible Samsung Galaxy M20 discount and the Samsung Galaxy M20 sale offers on Amazon. I have a camera that lets you capture it all from one extreme to the other. I’m the new Samsung #GalaxyMSeries. See me on 28th Jan.
A smartphone that does it all. I’m the all new Samsung #GalaxyMSeries. See me on 28th Jan.
Samsung Galaxy M20 launch date has been set for 28th January 2019, along with two other smartphones in the Galaxy M series, when the smartphone will be unveiled exclusively on Amazon.in with exclusive Samsung Galaxy M20 launch offers on the e-commerce portal. The smartphone is expected to go on sale for the first time on 5th February 2019 from Samsung’s own online store and Amazon India. The smartphone will be an Amazon Exclusive and will be launched on 28th January 2019 in India. We expect the Samsung Galaxy M20 price to start at around Rs 13,999. The smartphone will be available in a Black colour and will pack 3GB/ 4GB of RAM along with 32GB/ 64GB of inbuilt storage. There will be many launch offers for you to use including the Samsung Galaxy M20 bank offers on Amazon.in such as EMIs, discounts on prepaid orders and more. As the smartphone will be an Amazon exclusive, there are no available Samsung Galaxy M20 Flipkart offers which you might be wondering for, but we will surely list all the best available Samsung Galaxy M20 Amazon offers to bring down the price of the smartphone for you. How is the Samsung Galaxy M20 Design? It has a stunning Infinity U display and a metal body. Does Samsung Galaxy M20 case cover comes bundled in the box? Does Samsung Galaxy M20 has a USB Type-C charging port? Yes, there should be a USB Type-C charging port on the Samsung Galaxy M20. Does Samsung Galaxy M20 has face unlock? Yes, Samsung Galaxy M20 features an AI Face Unlock feature. Is the Samsung Galaxy M20 Fingerprint sensor fast enough? Yes, the fingerprint sensor on the Samsung Galaxy M20 is pretty fast. How is the Samsung Galaxy M20 Display? Samsung Galaxy M20 features a 6.3-inch FHD+ Infinity U display. Does Samsung Galaxy M20 have a dedicated microSD card slot? Yes, Samsung Galaxy M20 has a dedicated card slot for microSD. Does Samsung Galaxy M20 support Dual SIM Dual VoLTE? Yes, dual SIM VoLTE is supported on Samsung Galaxy M20. How is the Samsung Galaxy M20 battery backup? Samsung Galaxy M20 packs a massive 5,000 mAh battery that will last you almost two days on a single charge. Does Samsung Galaxy M20 support fast charging? Yes, it comes with 3X fast charging support.